Freud would be the dealer,the pipe,and the nightmare. A tiny but effective superstructure of psychologists, masseurs, professors, fortune-readers, researchers, psychotherapists, alternative "medicine" practitioners, etc, have made quite fortunes by convincing normal individuals in disarray that they - as individuals - suffer of "illnesses" such as "over-occupational guilt", "low-occupation guilt, "grief", "empathy loss", "burnout", "stress", "worries of getting cynical", etc. And of course, that only they can effectively cure them, or "rehabilitate" them - as the trick nowadays is renamed. Warning. The theses below do not intend to be offensive towards a) serious professionals, or scholars that are only guided by scientific spirits and do not get personal profit or economic gains on peoples' confusion, or b) those that really became ill of a medical or psychiatric condition. In my opinion, few single individuals have caused a more devastating impact in people's mental wellbeing than the psychiatrist swindler Sigmund Freud. The unscientific dogmas and myths spread by Freud and his followers are behind thousands of thousands of human tragedies. These would have been well averted with the use of scientific medicine, or in very many cases just with the use of common sense, logics, love, empathy and human solidarity. Freud's religion of hate and ungrounded determinism has killed more family relationships than any other faith on earth. Parents against their parents, children against their mothers, fathers against their nature of true fathers. 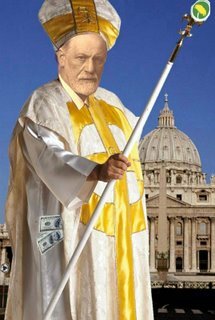 But destroing families is far the only kind of human catastrophe that Freud the pope - and his devoted priests - have fashioned and turned out to lucrative business. In nearly every situation in which a system of oppression - political or economic, or occupational - harasses a person (commonly already battered by other existential problems), there enter Freud. Not to suggests a change of the structural situation that abuses the person. Not to strength the psychological resources for the person to fight against the situation that oppresses him or her. None of that. The post-Freudian teaching and practice, and their book-selling enterprise, aims to convince the individual that all it is in his/her little own navel, and encourages its contemplation as main source for wisdom. He or her, the individual, is according the Freudians the one who is "ill", psychological unfit, a subject for a "psychiatric diagnose" such as burn-out (utbrändhet) or occupational-depression. He/she is not advised to stay at the work to understand better and to try change things for him and other co-workers. No, he/she would be encouraged by Freud to regard himself as a victim of his own inadequacy, diminished empathy, or physical impairment and tiredness. Otherwise, how come that "stress at the job" only affects her and not the rest of the individuals working in the very same place? I. The Freudian stress-professionals started advocating loudly - with no whatsoever epidemiological evidence - about the working environments being the only cause of increasing stress and burn-out, and even sudden deaths! (see here my article in Läkartidningen). In the message they used to deliver in public forums to the potential customer (the prospective "patient") to obtain understanding and positive contact, the main argument is that we are facing a full scale "epidemy" of bad working places, new organizations at the working sites, etc., all which result in that the working persons get burnout. This in its turn would have resulted in a national epidemy of this "syndrom" (question that also resulted to be false). The first approach towards the single individual could summarizes as in this illustration: "Feeling blue and tired, problem to fell sleep? Well, It is is not your fault, it is the stress situation at the working conditions. You are just affected by that. Otherwise you are a good and healthy person, and even very good, in the sense that you are more work-commited than others!". II. As time goes, and people learn how to "identify" what they believe they suffer of (utbrändhet as a container-term in which quite diverse symptoms, feelings, or personal situations, would find a place), the same Freudian stress-professionals start to favour an individual-oriented solution (not structural-oriented). This in no way touches upon the responsibility the working environments and its management is supposed to have in the causation of the problem (according to the previous Freudian's claim). This is the moment of the "psychiatric diagnose", and which entails automatically a long sick-leave for the individual and the corresponding antidepressant-drug treatment. All this, independent if the person is actually ill or not, in medical terms. It would be enough that he/she regarded him/herself as inadequate or self-rated "ill" (see here my comment Utbrändhetsdiagnoser på reträtt in Svenska dagbladet). III. As time goes even further, many, or too many, have answered the call of "having the feeling" (upplevelse) on they may be also ill and the situation starts really getting out of control. Very much because the GP physicians sick-list people, actually in most of the cases, in the absence of a medical situation! "Is Sweden really that sick"? ask the rest of Europeans, and the pressure on politicians gets harder. The exaggerated number of sick-listed persons resulting from above poses the imperative of getting people soon back to work, and gets those figures down as soon as possible. The moment for the real payoff has come for the Freudian strategists: Rehabilitation services. What a million-deal. Rehabilitating what? Well, that will not be the issue just that people get back to work. Varsågod, here you are, one million more. a) Much of the problem arisen by the agitation Freudian professionals have done in magnifying the so called phenomenon of increased stress in society. b) More that than the actual levels of stress in society, what it has increased is our awareness of the stress-problem. This helped at masses-level by the uncritical megaphone effect of the media. c) In other words, we do not have enormously more stress than, say, ten years ago, what happens is that we are now enormously more focused on everything which might be stress-related. We have culturally learned these concepts, and cultivated thereafter this social helplessness behaviour. We have been mass-convinced we are inadequate to survive and live as normal individuals. For the first requisite for the individual survival in society is the struggle for changing that society, not the collective and self-destructive giving-up. d) The very same academic and professional sectors which have agitated, deformed, exaggerated, or even lied to the public about the effects of stress in the peoples health, are those which may have obtained substantial economic or academic gains with their research and treatment enterprises. e) In the treatment of this absolutely unclear and scientifically unconvincing Freudian inspired "syndrome", have other sectors also had an enormous economic profit at the expenses of public means. This is the case, for instance, of the pharmaceutical industry engaged in the sale of certain antidepressants [see here for updated figures of 2005]. No wonder, the drugs did not work as expected, regarding treatment of the so called burnout. The individual-focused solution commented above (long sick leaves for the individual, argued on discussable psychiatric diagnoses) it is clearly a non-solution to "the epidemy" of occupational-related burnout, attending to the structural causation them selves, the Freudian stress-priests, have said the problem has. Neither has been scientifically established that the diathesis of those manifested symtomps are indeed caused only by endeavours at the working place. So suddenly, here we have the pirouette: the individual - and not the work - is the one making the problem. It is not any longer "stress in society", particularly, or solely, at the working sites, what increases so huge. That they used before as main argument, but it is now gone. What they now do say is that the individuals are those who may be getting more and more vulnerable for that self victimization, independent of management. And just how many they are? "30 percent of the Swedish population. Of these, 15 percent because they work too much, and the other 15 percent because they work too little" (free quote from Interview with psychologist Alexander Perski, Studio 1, Swedish Radio 19/12-05). But they have the cure, so they say. So, if you are among the 30 percent of that population, you are one of the three Swedes which will probably need "rehabilitation" for some months in the near future. If you do not have the money, no problem. Your Health Insurance has. In Sweden this means we, you and me, the taxpayer. And we pay also for the antidepressants, and for the parasites that profit on poor people that most likely were not ill in the first place. Perhaps they just reacted to an ill, too Freudian, society. As things have evolved, the core matter of this debate appears no longer to ascertain whether there is more stress, or just how much more, out there in the working-life. And if so were the case, what would be the real cause of that increase (For my part, I have always maintained that what has increased is the collective - subjective- appraisal of the phenomenon, not the phenomenon it self). None of those things seems to be of importance any longer. Even the acknowledgement that the cohorts of sick-listed due to ”the problem” have shown a stabile statistical decline has not deserved a fair comment. Who cares? What seems to be the matter now is that we have managed to produce huge numbers of long-time sick-listed in Sweden (the largest figures in Europe), of course, "due" to that intangible stress. The bottom line nowadays stressed by the burnout apostles is that there is today an objective need for "rehabilitation" of those persons, arguing also that only their rehabilitation method succeeds in putting people back to work. The threat of epidemics has now been traded for the incitament of "problem-solving" towards an easying the burden of the National Health Insurance system. That is why, in their recent PR-offensive, the Freudian priests put forward so vehemently the emphasis in the "problem of rehabilitation". Here it is where the real fat buck is waiting, and the rest it is purely and forgotten "academic" discussion. But it is not. And it should be also a discussion about ethics. In this Freud revisited, we find a similarity with the Mafiosi in Manhattan in the 1920's. First they went, covered by the night, and smashed the windows of numerous shops in the street. The day after they went to the same shop-owners to offer both to repair the windows using their own "convenient prices" and methods, and protection "to solve the problem". And do you know? The shop-owners believed on that for a long time. 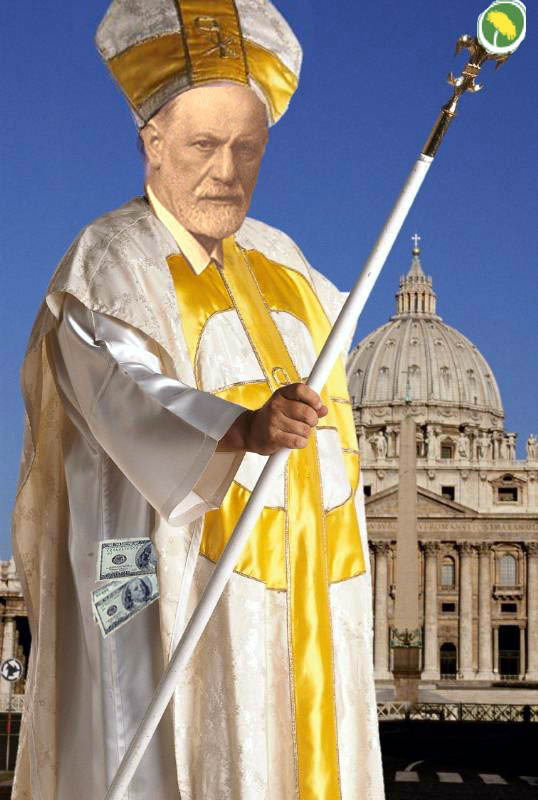 If religion is the opium of the people, Freud is the dealer, the pipe, and the nightmare. Note. "Sjukskrivningarna ökar i samma takt som utgifterna för antidepressiva medel. Interesting commentary. Do you think Sweden's 'collective' mindset helped create 'utbrändhet syndrom'? I have a hunch that 'burn-out' is because of cultural framing. It's an individual problem regardless of work environment, but the label 'burn-out' allows the pill (other tax payers paying for treatment and sick leave) to be swallowed more easily.